The Chalmers Ladies’ choir welcomes you to our spring concert, on the 11th of May at 4 pm! 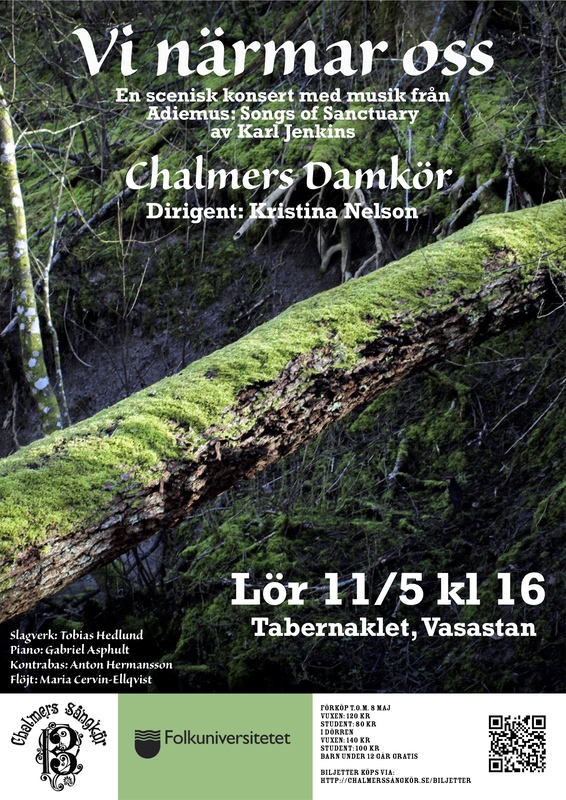 The theme is “Vi närmar oss” which means “We are getting closer” and we will perform the composition “Adiemus: Songs of Sanctuary” by Karl Jenkins. The composition has been part of the soundtrack to several movies, and is a refreshing mix of classical music and world music. Together in the choir we have interpreted the music with movements to further enhance the message of the composition. “We are getting closer” is also about the spring getting closer, and we will celebrate this by singing “Songbird” by Sarah Quartel, and an arrangement of “Scarbourough Fair” by Stephen Smith. The concert will be in the Tabernaklet church in central Gothenburg, which can be accessed by the tram station Valand or Vasaplatsen. For more info see the link: https://goo.gl/maps/wQPFUg5AS6K2. Tickets can be prebought or bought at the concert day in the church. Children under the age of 12 are of free entry! Tickets can be prebought until May 8. You can either buy from members of the choir or pay directly to our swish-number. The choir's swishnumber is 1230833087, mark your payment with the number and type of tickets you have bought, for example: "DK-konsert V:2, S:1", which means you have bought tickets for 2 adults and 1 student.